March 9th, Saturday, Warsaw, Piw Paw Beerhaven at Foksal St. 16, A.D. 2019. Its rainy, gloomy and cold. Most people would rather stay home that day… Meanwhile, a dozen or so Antediluvians decides to leave their havens, break the eternal sleep and once again, after many years of slumber, take part in the Eternal Struggle. 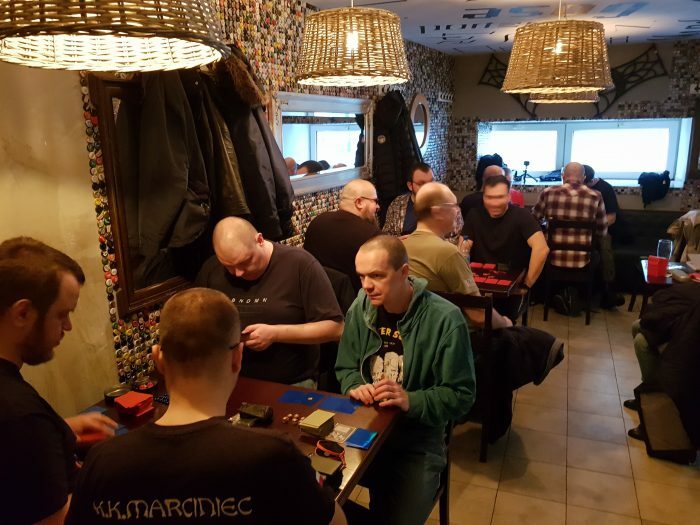 This is how the V:TES reactivation tournament took place in Warsaw after a long break. The occasion was perfect, since the latest V:TES Sabbat starters have been released by Black Chantry, so why not test them out? The tournament was a form of test in itself. I was wondering...were there any vampires still „alive” in Warsaw after all this time? And yes they were, not only alive but kicking. We also had guests from the East, but unfortunately the South – eastern vampires were struck by some weird disease and couldn’t join us. Finally, to maintain the arranged formalities, two players opted out, and the tournament began with 12 participants. We decided to play the preconstructed tournament with the new decks. Three rounds were played, followed by the finals. Each table had a representative from each clan included in the starters - Lasombra, Tzimisce, Toreador antitribu and Tremere antitribu. After the short and emotional final game Sbodek came out as a winner, representing the Toreador antitribu. The greatest surprise was that Sbodek won with the deck that was definitely the weakest of all available ones. During the preliminary rounds he was the only person to actually score any points with this deck (not counting the 0,5 VP gained by time limit by Bartek), and he even managed to easily secure the win during his third game. This gave him the third spot (tied with Kacper, Tremere antitribu). Nevertheless, let’s just say that he wasn’t marked for victory in the finals and nobody expected such turn of events. Since Kacper and Sbodek had the same amount of points, a dice roll decided their fate and the Tremere antitribu were the first to sit at the table. Sbodek decided to be their predator, but the situation was quickly changed by Jaskier (Tzimisce), who sat between them (perhaps because he had a thirst for revenge from the last game he played against Kacper, where his Tzimisce fell under the onslaught of the Nephandi). Finally, Radek, who scored the most points during the preliminary rounds, decided to sit between Kacper and Sbodek and become the predator for the Toreador antitribu. As he himself later admitted, this choice was wrong and most likely costed him the finals, but let’s not get ahead of facts. The final round started very luckily for Radek, who drew Zillah’s Valley in his first turn and quickly influenced the first vampire – Carolina Velez, with her special ability (immune to damage from allies) effectively weakening Kacper’s strategy for the Nephandi. Seeing that, Kacper decided to attack aggressively, hoping to pressure down the Lasombra and dealing pool damage every turn, while defending from the „constantly growing stronger” Tzimisce on his back. As a result, Sbodek had almost no pressure, apart from an occasional bleed for 4 and two KRC’s, so he could build his little army effectively. At some point Radek tried to deal with Jaskier and damaging his predator with political actions. This quickly made Kacper’s situation dire. The final blow to the Nephandi was struck by Sbodek, who stole one of his Nephandi (the first Entrancement was blocked, but there he had the second one…) and effectively dismantled his last line of defense saying „you won’t need it anymore and I can have some use for it”. Next turn Kacper was ousted and Jaskier gained significant advantage on the table. This is exactly when things got weird. It seemed that Jaskier’s Tzimisce are already victorious, with his very strong position, backed by Smiling Jack with three counters on it. Since Radek’s vampires were almost dried out at this point, he heroically decided to burn the Smiling Jack, but the impressive amount of stealth was still not enough to break through the Tzimisce wall. This however was Jaskier’s greatest mistake – hoping to draw more resources to defend himself he opened the way for Sbodek (who was waiting patiently for the occasion) to oust him. A Palla Grande mass bleed by the Toreador antitribu quickly ousted the Tzimisce, and next turn the Lasombra also turned to dust. Congrats for the winner! Toreador antitribu – 4,5 (1GW 4VP Sbodek and 0,5VP Bartek). And such was the outcome. We had great fun, met again with some old friends and decided that the resurrection of V:TES is a thing. If you ever wander into Warsaw and look for a casual game, give us a shout. Or better – come for the Grand Prix in May. Or some other tournament we’re planning to run – see you there!